Start with the Macrobond document open and the chart you want to tweet selected in the analysis tree. Click “Send to Twitter” Note: The first time you use this feature you’ll be asked to log in to your Twitter account via the Macrobond application. You can create a default text or hashtag for your tweets. Just type the text you’d like to save and click the save icon to the right of to the text box. It may be a good idea to select the Transparent as white option. Twitter may show your tweet on canvases of different colors, and making the transparent parts of your chart white is a good way to ensure that it’s always legible. Click “Send”. 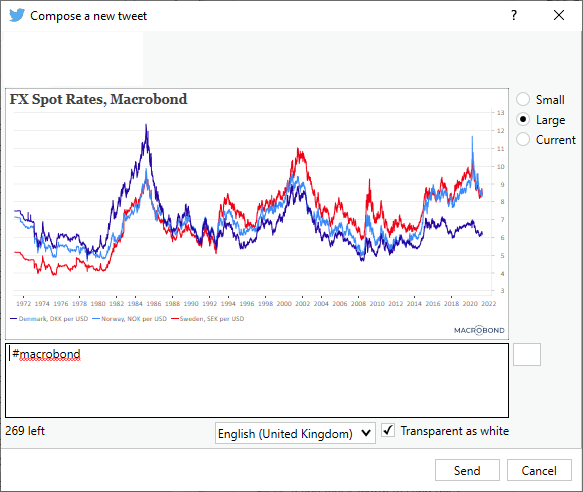 You’ll get a notification from Macrobond that your tweet has been published. 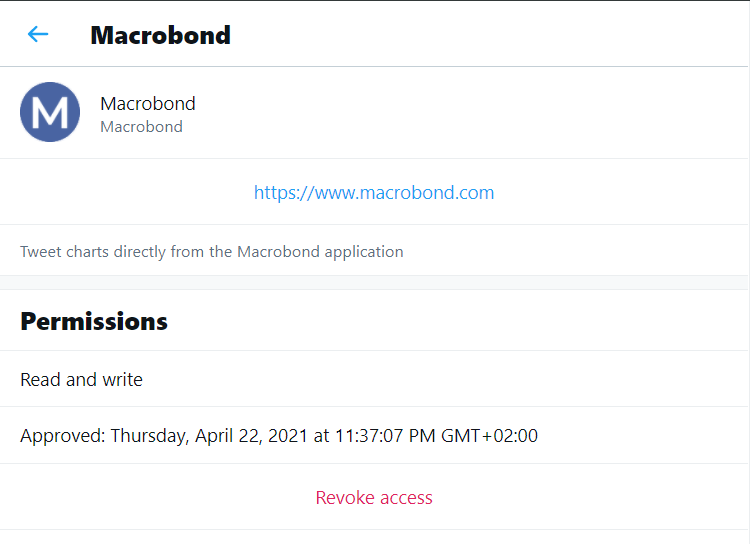 The first time you will try to use this feature, you will be required to authorize the Macrobond Application to access your Twitter account. Macrobond will not store your Twitter credentials, but an encrypted key received from Twitter that allows the application to send messages using your account. If you want to revoke the application’s access to your Twitter account, you can do so in your Twitter account settings.